Owen Smith and Angela Eagle are challenging Jeremy Corbyn, the Labour Party leader, in an increasingly bitter race. As the Conservatives complete their swift, if not a brutal change of power, the Labour Party, on the other hand, is descending into a self-destructive warfare. Labour Party’s National Executive Committee, will lay down a timetable for the party’s leadership contest, with people expecting the results to be announced on 24th September. Angela Eagle, the ex-shadow business secretary, and Own Smith, the former work and pension’s secretary are the two main contenders for the seat, and the next Labour Party leadership odds have been focused mainly on them. The party’s NEC ruled out any possibility of Jeremy Corbyn to be automatically included in the contest, without having to get the backing of 51 MPs and MEPs as required by the party’s rules. The NEC also banned any person who hasn’t been a full-time member for a period not less than six months – inclusive of the 100,000+ members who joined after the famous Brexit vote – from casting a vote unless they’ve paid a fee of £25 to become “registered supporters” in the 48-hour window period that they’ll be given next week. What Do the Polls Say on the Next Labour Party Leadership Odds? According to the latest political poll as shown by Ipsos Mori, which was carried a week ago, and before Theresa May become the UK’s Prime Minister, and the NEC secured Jeremy Corbyn’s name on the ballot box, the current leader had a satisfactory rate of 24%, which was down by 8% compared to a poll that was carried a month ago. However, among the Labour Party members, this rate was almost equal, with 45% satisfied and 48% not. What Do the Bookies Say on the Next Labour Party Leadership Odds? 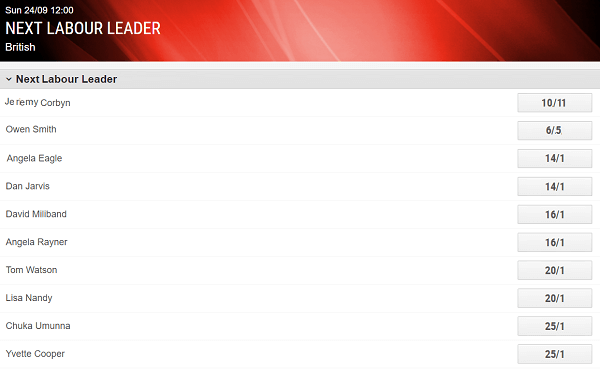 According to most of the bookies online, the next Labour Party leadership odds indicate that Jeremy Corbyn is the favourite to win the leadership elections at around 10/11. Owen Smith comes in the second spot with Labour Party leadership odds of 6/5 pushing Angela Eagle into the third spot. According to the next Labour Party Leadership odds, the odds have shifted from 2/1 at the start of the week to 10/1 today. Labour Party Leadership Odds and Polls: Whom Will It Be? According to the NEC, Jeremy Corbyn will automatically be included on the ballot for the Labour Party leadership. After sitting in a meeting that nearly lasted for six hours, the NEC voted 18:14 to allow the current party leader to defend his post without having to be nominated by MPs and MEPs. According to the party’s spokesperson, this is a huge victory for Jeremy Corbyn and his wing of the party. He is now the favourite to win the Labour Party Leadership, and if he does succeed to retain the seat, the 172 Labour MPs who voted against him will have the option of shutting up or splitting off from the Labour Party and forming their own party. According to reliable sources, the rebel MPs are preparing for a vicious fight, with some of them privately threatening to prompt multiple by-elections shall Jeremy Corbyn survive. According to most moderators, they fear that the Labour Party is now faced with an “all civil war” which shall eclipse what was witnessed in the 80’s era, and it could have dire consequences of splitting up the party for good. Just recently, Jeremy Corbyn called for dignity and calm from the members after a brick was thrown to Angela Eagle’s constituency office. He added that he’s also received death threats and urged supporters as well as the members to treat each other with dignity and respect. What Are the Odds of Eagle Becoming the Next Labour Party Leader? Various bookmakers online are only taking bets on who might be the most likely replacement for Jeremy Corbyn, but not on whether he shall remain as the party leader. 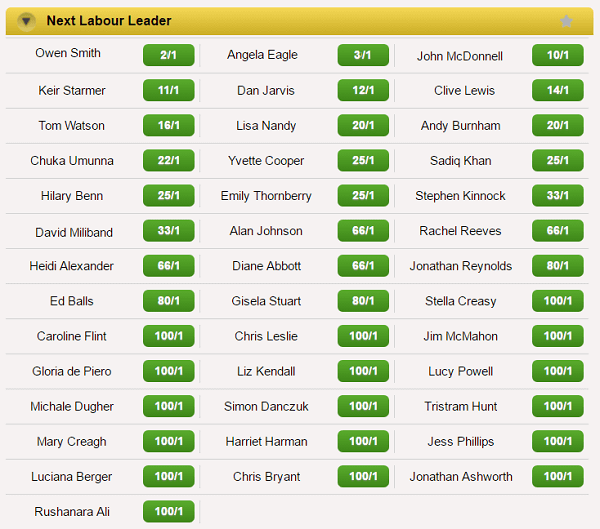 For example, Coral have declared Owen Smith as an even-money contender, with other bookmakers offering odds of 2/1 for Owen to win the elections of the next Labour party leader. Eagle’s odds, on the other hand, have shifted from around 3/1 to 5/1. Other people expected to announce their bid for the next Labour party leadership include David Miliband, Dan Jarvis, and John McDonnell. What Do the Polls Say? A poll by YouGov, which included 777 unit members, 65% of the members felt that Jeremy Corbyn wasn’t performing his duties as the Labour Leader while 79% of the members thought that Jeremy Corbyn would never become UK’s prime minister. 35% of the members also believed, that Jeremy Corbyn should remain as Labour Party’s leader and become the torch bearer into the next UK general election. When asked whom they’d back to replace Jeremy Corbyn as the Labour Party leader, one-third of the members were not sure. However, 15% of the members said they’d rather have Eagle replace Jeremy Corbyn through the vote, who was closely followed by Andy Burnham, Hilary Benn and lastly David Miliband. Meanwhile, a YouGov poll carried out on 1,203 Labour Party members indicated that 48% thought Jeremy Corbyn was underperforming as the party’s leader, and 44% of the total population thinking that he should step down. On replacing him, Jarvis was the most popular choice with 13% of the members supporting him. Eagle came in the second position, and Burnham is coming in the last position.